BREATHPATROL® is an exceptionally effective breath lozenge that totally neutralizes bad breath. Whether the offensive breath odors are from smoking cigars or pipes, eating a garlic salad or having a beer with lunch, BREATHPATROL® totally eliminates all traces of lingering breath odor. 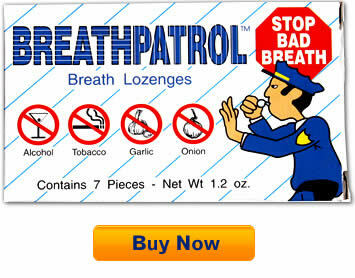 BREATHPATROL® is a pleasant tasting lemony-orange flavored lozenge that has no competition. All other breath mints just mask breath odors. After having a beer for lunch you smell like a brewery. After sucking on a spearmint candy you smell like a spearmint brewery. Flavored chewing gums are equally ineffective. BREATHPATROL® leaves your mouth smelling totally neutral with absolutely no cover-up smell! Only BREATHPATROL® successfully neutralizes your bad breath and totally erases all smell of beer, garlic, onions or tobacco. BREATHPATROL™ is an exceptionally effective breath lozenge that totally neutralizes bad breath. Whether the offensive breath odors are from smoking cigars or pipes, eating a garlic salad or having a beer with lunch, BREATHPATROL™ totally eliminates all traces of lingering breath odor. BREATHPATROL™ is a pleasant tasting lemony-orange flavored lozenge that has no competition. All other breath mints just mask breath odors. After having a beer for lunch you smell like a brewery. After sucking on a spearmint candy you smell like a spearmint brewery. Flavored chewing gums are equally ineffective. BREATHPATROL™ leaves your mouth smelling totally neutral with absolutely no cover-up smell! Only BREATHPATROL™ successfully neutralizes your bad breath and totally erases all smell of beer, garlic, onions or tobacco. Who does BREATHPATROL™ appeal to? Anyone who is conscious about their breath. People with halitosis. People who eat garlic, onions etc. Anyone who likes to drink alcoholic beverages. Smokers. Everybody who wants to be sure of neutralized fresh breath. BREATHPATROL™ is not just a candy. BREATHPATROL™ – Works instantly in the mouth and in the stomach.